If you own a car and you are a music aficionado, you’ve probably made sure that your car audio system is already set up for your hearing pleasure. However, if you don’t own a car, or you ride along in someone else’s chariot from time to time and still want to be the passenger DJ, this article will help you learn how to play music from phone to car without aux. 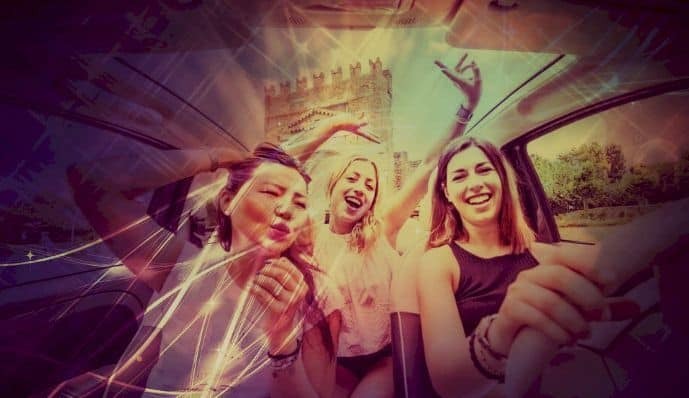 Have you ever wanted to share your favorite song or Spotify playlist in your smartphone to your friends while you’re planning for a road trip? Perhaps you wanted to set a good mood with your romantic song while you’re in the car with your crush? Maybe you wanted to play the latest fun song for the kids riding along with you? Or maybe you just want to hear that new and catchy pop hit that you’ve been humming in your head all day through your car audio, and you don’t want to wait until an FM radio station decides to play it? You charge your phone battery, prepare the songs in your phone, bring along your trusty Aux cable to plug into the car’s audio system, and find the familiar round port, and you can’t find any! Ouch. There go all your plans for a music-filled trip. Is there a way out of this dilemma? Yes, there is. Or better yet, there are. If the car has a relatively old audio system, you can choose from two options below. Plug in the cassette tape adapter’s 3.5mm audio cable into the phone’s headphone slot. Browse the audio system’s menu to find “tape” mode, then press play. Adjust the audio volume to the desired levels and enjoy! Connect the FM transmitter to the car’s cigarette lighter port (the big round one) so that your transmitter will have a power source. Power up the audio system and choose the FM mode. Match the same frequency in the audio system with your FM transmitter. Turn on your smartphone’s Bluetooth and follow the necessary steps to pair the phone with the FM transmitter. Play your phone’s music and enjoy! If the car’s audio system is fairly new and does not come with a cassette tape player, you can still use the FM transmitter option. However, most new audio systems nowadays come with two more convenient options, and we will discuss this below. Navigate through the settings menu in your smartphone and find the Bluetooth settings. Turn on your smartphone’s Bluetooth connectivity option. Turn on your smartphone’s Bluetooth visibility to other devices. Power up your car audio system. Locate the Bluetooth menu in the car audio system’s home settings or home screen (the menu and shortcuts may differ across audio systems). In the Bluetooth menu, select the option allowing you to pair with other devices. The audio system will scan all devices within range. It may also display other devices with which the audio system was previously paired. Select your smartphone’s name (by default, this will be your phone’s model name or your personalized phone name if you already changed it). ​The car’s audio system will display a PIN on its screen. This number will enable your audio system to authenticate the smartphone that you are trying to pair with it. At the same time, your smartphone will display a dialog box asking for this PIN. Enter the PIN in your smartphone to proceed with the pairing process. If the PIN is entered correctly, the audio system’s screen should display a successful connection message. Play your music from your smartphone and enjoy! Find the USB port of your car’s audio system. This could be at the front of the audio system’s head unit itself, or in some higher-end models, additional USB ports are placed somewhere in the dashboard, glove compartment, center compartment (between the driver and the front passenger), or even in the center armrest of the rear seats. Plug in one end of the USB cable to your phone and the other end to the audio system’s USB port. Your phone will recognize the connection and will display a USB connection notification. Proceed with your smartphone’s steps in allowing the connection to be made to the audio system. Depending on the brand or model of the car’s audio system, you may be given a choice on whether to “mirror” your phone’s screen into the audio system’s screen, to direct your phone’s music to the car’s speakers, or the audio system can simply use your phone’s memory card to search for playable music files. Whatever choice you make from #5, you’ll be able to play your smartphone’s music in the car audio system. Enjoy! Are these tips helpful? Now you know how to play music from phone to car without Aux. So what are you waiting for? Give them a try! HI, John Andrew here. I’ve been an audiophile since I was a little kid. I’m an original member of myaudiolover . It emerged as a way for me to share my passion and knowledge for audio technology. If you’re looking for tips, techniques, and insights about audio-tech, that can enable your productions that professional edge, then MyAudioLover is the place for you!